The Rock'n Reno World Challenge Cup for 2012 for 50+ and 55+ teams for Senior Softball was played in Reno, NV the weekend of June 1 - 3, 2012. Three teams from Boise played that weekend. Baird's/Enterprise Electric played teams from California, Oregon, and Colorado and placed second in the 55+ AA division. The team placed three players, Dave Linger, Gaylan Moore, and Dave Dawson, on the All Tournament Team. C.C. Over played in the 55+ AAA division and won that division by going undefeated in the double elimination bracket play. The team placed 5 players on the All Tournament Team. They are Rick Carringer, Harold Killgore, Randy Livingston, Curt Jackson, and Wayne Darling. 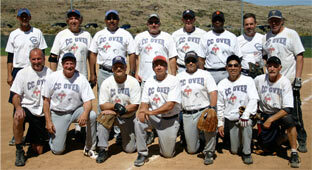 The Fly 50's team (pictured above) played in the 50+ AAA division. They lost their second game of bracket play and came back to win the championship of that division. The team placed five players on the All Tournament Team. They are Dave Brown, Steve Hallock, Mark Haggerty, Tony Laird, and Rich Wyatt. 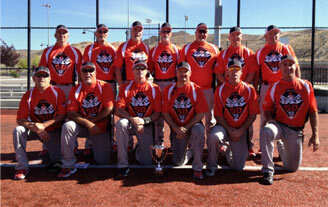 The three teams from Boise won two firsts and a second in their respective divisions. This was a great showing for Boise Senior Softball.